The journey starts with a weather report received as the front door opens to blue sky. Sun falls softer, warmer than the breeze. Two consecutive days of sun. : a Long blustery winter that kicked up rough seas and threw drenching squalls across the face. Navigating a small boat on that water would have been stupid. Recipe for a quick paddle: weather report. check tide times. cradle on roof rack, kayak on cradle. paddle next to kayak. tie down. spray skirt, bouyancy aid. water bottle, sea bag of dry clothing. snak food, chocolate and mandarins. water resistant phone. blue tooth ear buds. kayak trolly. Hat, gloves. sunscreen. spare rope. Yumyum yellow kayak, cradled on the car roof. At the boat ramp, a smiling Chinese man says “After see ‘nother lovely blue sky, I not stay inside a minute longer.” He backs his trailer and boat down the ramp, eyes twinkling in the bright sunlight. Across the harbour there a floating objects. Some are essential for navigation like the green and red buoys marking the channel. Less essential objects are the plastics bottles bobbing in a trail across the harbour to the beach at Devonport. They are each plucked, drained and captured under bungy cords to be deposited at the beach recycling bin. An elderly woman nods at the handful of plastic and grunts in approval as they slip into the bin. There is another younger woman, a toddler and and an Australian Cattle dog on the beach. The woman throws a ball along the beach. The dog fetches the ball. The woman throws the ball into the water. The dog fetches the ball. The child try’s throwing the ball. The dog quickly returns the ball. A small fluffy cross breed dog arrives on the beach. The woman throws the ball once more and the small fluffy manages to beat the cattle dog to the ball. There is a brief squabble between the two. Fluffy drops the ball, flees yipping and crying to the safety of its owner. I’m getting the kayak back in the water, skirt and buoyancy vest on. The child would like a ride but is distracted by the dogs. Too late. I’m away again. To float on todays serene calm tide. This story was to be about the serenity of floating on a calm harbour, but it got busy The pictures are more about fleeting serendipitous moments. 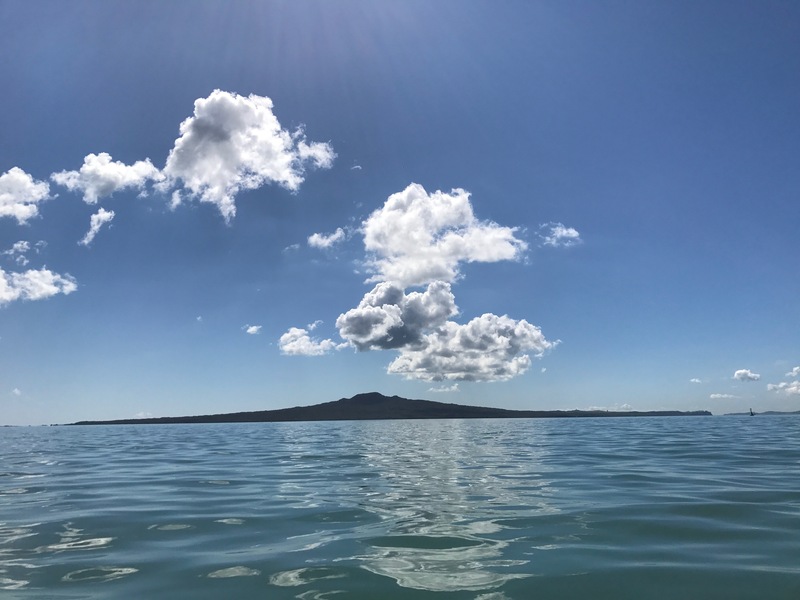 Above the gentle slopes of Rangitoto Island, towering clouds erupt. sending their reflections across the calm water. 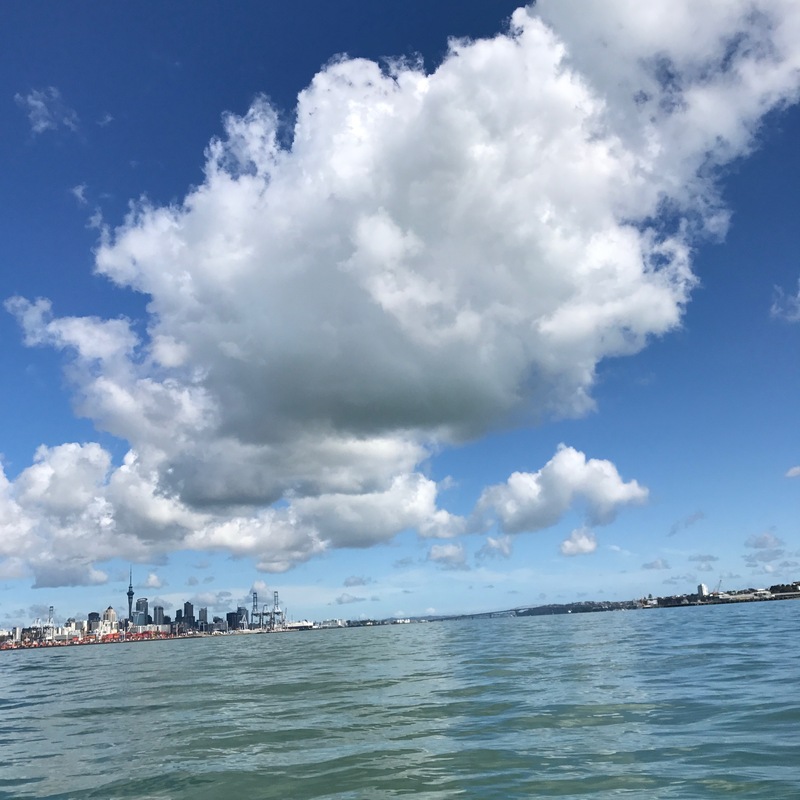 Despite the serenity, everything moves, the paddle thrust, responding spurt of kayak, tide withdraws from the harbour tilting a starboard channel marker, clouds shift, the planet moves, the day shifts. Seasons arrive and go. Now winter stirs over the horizon.